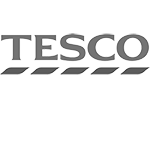 Use tabsurvey as an alternative to mystery shopping. 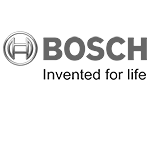 Our app can substitute a costly mystery shopper as an auditing app or store inspection tool. Once a survey has been completed the survey automatically loops back to the starting point. Ideal for an auditing app. 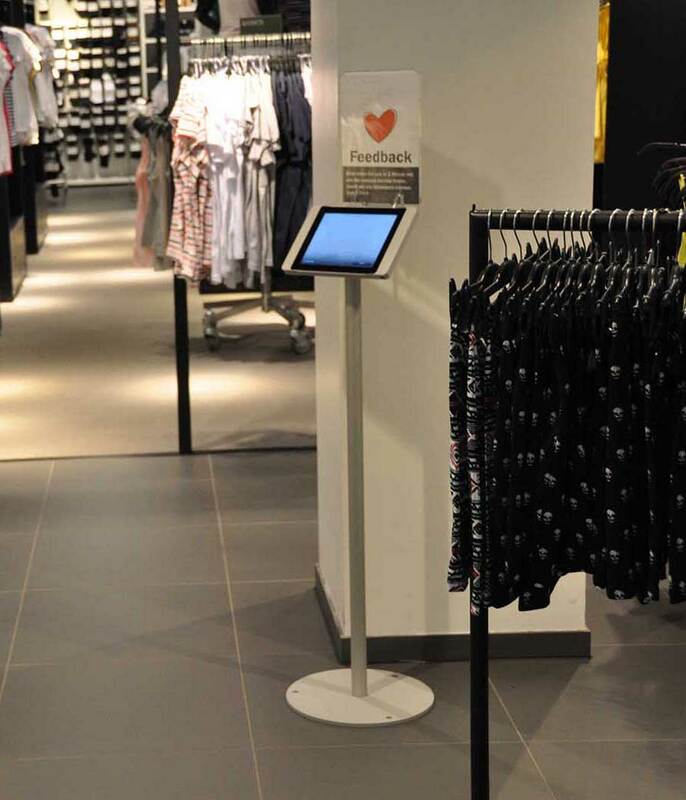 In your live report you can track and target the KPIs for your store inspection survey. Track each channel or location and compare results. Set up your mystery shopper form in minutes. Compose your own survey or choose between our templates. 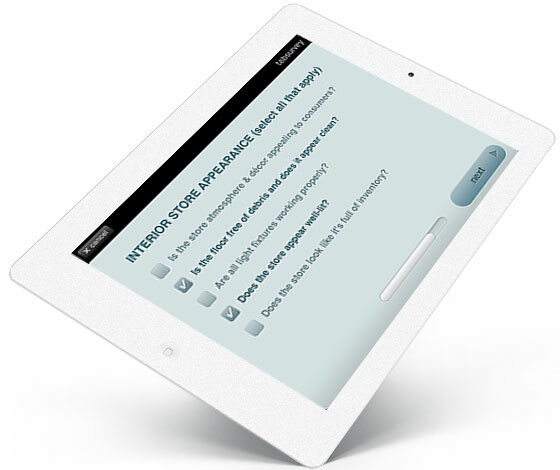 Download the survey to the iPad app and you're all set! With our evaluation app for iPad, your data is stored securely in the cloud. View your reports or download your data wherever, whenever. Want to use the auditing app for something else? 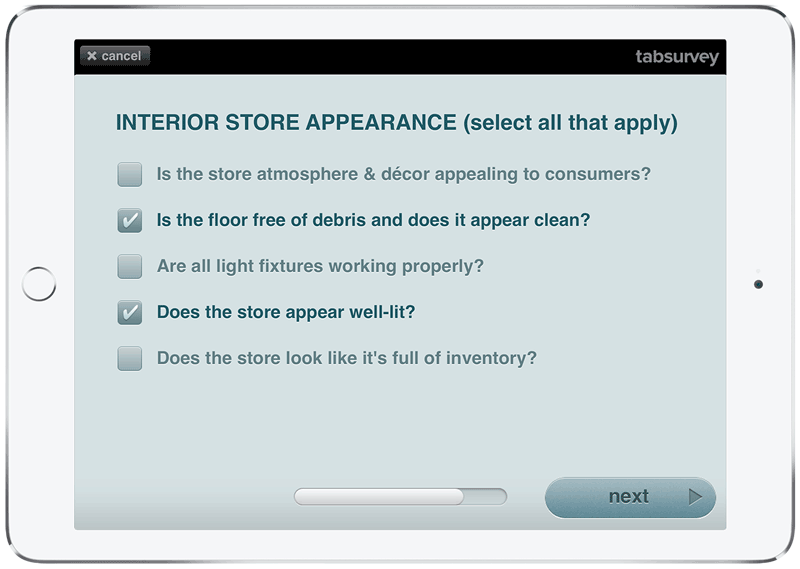 Send a new store inspection survey to your iPad in seconds. The publish function enables you to update your surveys from your desk. Our app works without internet. This makes it ideal in places with bad cellular coverage. The app syncs your mystery shopper questions when it's back online. Mystery shopping is a way of getting a here-and now picture of how your store is performing on an array of KPIs. Maybe you’re examining a store’s interior appearance, or maybe it's the service levels or the product offering, or the traffic flow? The mystery shopper questions to ask could be many, but our point is that you should be asking your real customers in stead of an instructed, paid mystery shopper who might not even be inclined to do her shopping in your store in the first place. That's why our mystery shopper form provides a great alternative to mystery shopping. When using our survey tool as an auditing app or for store inspection, you can get access to great templates that could inspire your work. Simply select a template, edit and download to your iPad. Sign up now and get started!